Nokia has finally and officially launched there first Android powered smartphone in India, the Nokia X. Many peoples waited to own Nokia’s Android smartphone, finally the desire can be full filled now. The Nokia XL and X+ will be launched before June 2014, said the company’s official. Specs of the phone are not the top most, but its a good combination of price and features. 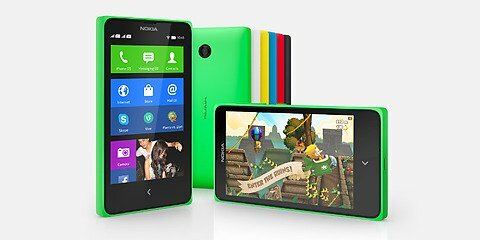 The Nokia X has 4 inch Display with 800 x 480 pixels WVGA resolution and Android 4.1 Jelly bean OS. It is powered by the 1.0GHz dual core processor based on Qualcomm Snapdragon S4 Play MSM8225 chpset. To make the handset more snappy and to enhance graphics plus game-play capabilities there is Adreno 203 GPU. It measures 115.5 x 63 x 10.44 mm and weighs 128.6 grams. To make it alive there is 1500 mAh battery, which would make you despondent, but it also depends from person to person. It has DUAL SIM Support with HSDPA + HSUPA. There is 512MB of RAM and 4GB of Internal Storage plus micro SD card support for further expansion. It features 3G, WiFi, Bluetooth v 3, A_GPS, FM radio, micro USB and 3.5 mm audio jack. It houses 3-megapixel Fixed Focus Primary camera and lacks the secondary camera. There are many handset, which can compete ( VS ) with it at this price tag. The Nokia X will cost you INR 8, 599 and it is available in White, CYAN, RED, Green and Black colors.